Guided Tissue Regeneration: These procedures attempt to grow back the previously lost gum and or bone tissue around the natural teeth. Some techniques utilize membranes, which are used to cover the bone defects and under the gums. Regenerative techniques often include the use of bone grafts. These procedures are carried out in the office with local anesthetic. Guided Bone Regeneration: These procedures attempt to grow back the previously lost bone tissue after one or more natural teeth have been lost. Over a period of time, the jawbone associated with missing teeth atrophies is resorbed. This bone would be unsuitable for the support of dental implants. 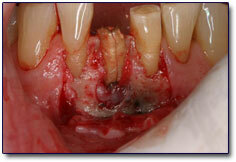 Today, it is often possible to re-grow or regenerate bone where we need it for the support of dental implants. This, in turn, gives us the opportunity to effectively restore esthetics and function to their natural state. Ridge Preservation: This technique involves the careful management of sockets after tooth extraction with the goals of preventing bone loss and a better outcome for implant placement.